​Seven out of ten adults in the United States say they experience sleep or stress on a daily basis, it probably goes without saying that would be a problem for us being able to function in our everyday life. The importance of a good night’s sleep is often taken for granted. It has been reported that sleeplessness can have a significant impact on everyday life and can affect our overall health. This OLIMEDICS branded brain formula is designed to bring you the benefits of advanced nutritional science in convenient tablets. 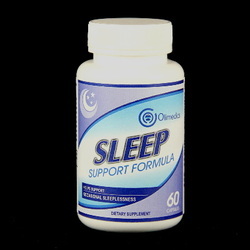 This is a simple yet precisely formulated blend of ingredients which help support healthy and natural sleep, yet prevent the frustrating dream disturbance and hang over in the morning. As a dietary supplement, take one (1) to two (2) capsules at bedtime, or as directed by a health care professional. Valerian Root, Passion Flower, and Melatonin.